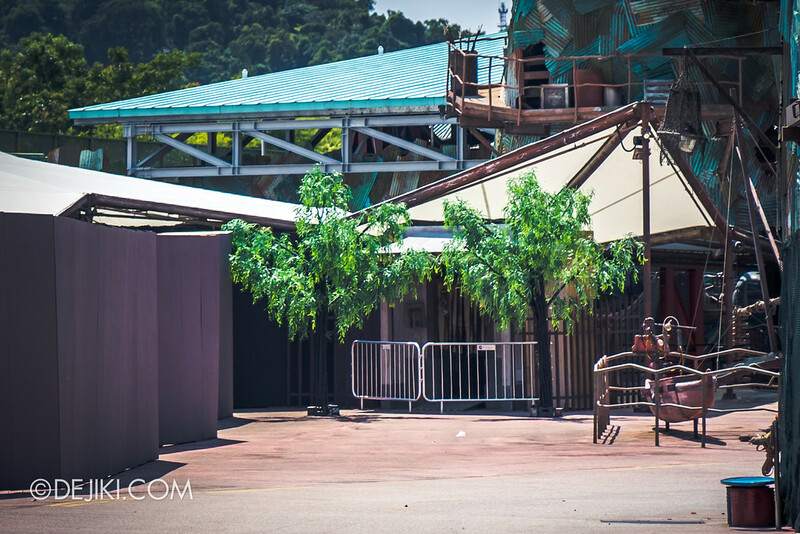 Final preparations for Halloween Horror Nights 8 are underway at Universal Studios Singapore. 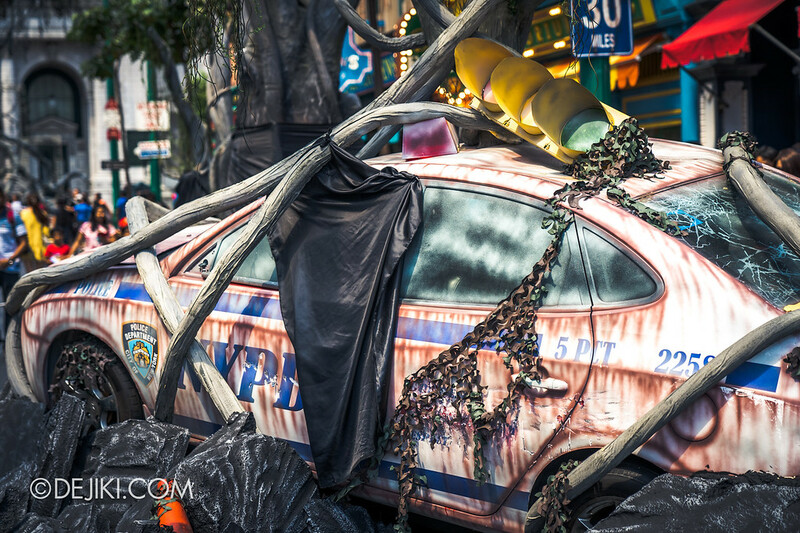 Just a few more days to the opening of Halloween Horror Nights in Singapore! 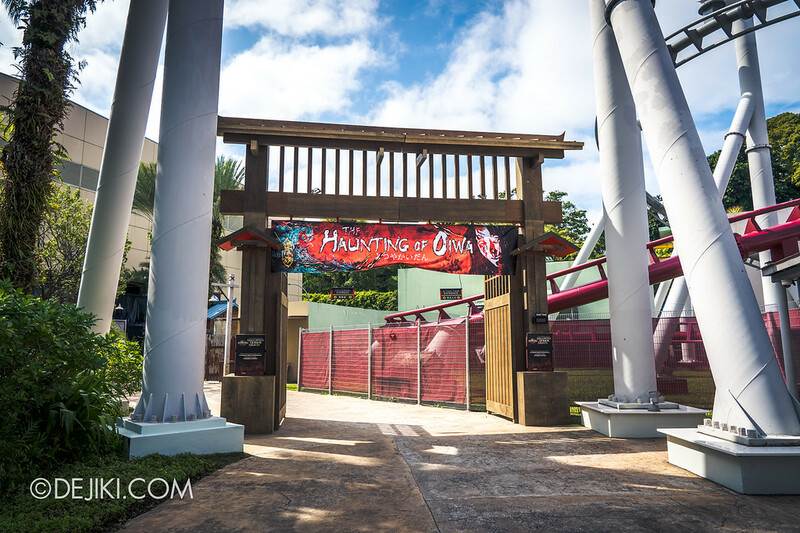 For this last BEFORE DARK: Halloween Horror Nights 8 article, I did something new: A walkthrough tour video of USS HHN8 that covers all the attractions and HHN visitor tips plus a giveaway, which you can find at the Vlog section of this article. The Haunting of Oiwa‘s entrance is finally unveiled. These gates will lead you to the Japanese village where you can witness a very tragic tale of betrayal. Some elements of the Japanese-style house facades can be seen from Ancient Egypt. Anyway, recap time: This house will use “hologram” technology to conjure Oiwa’s haunting apparitions. I wonder how the park is going to set up the experience for the Pagoda of Peril. How will we stumble onto it? From a cemetery? Ai’s house, like in the short film? 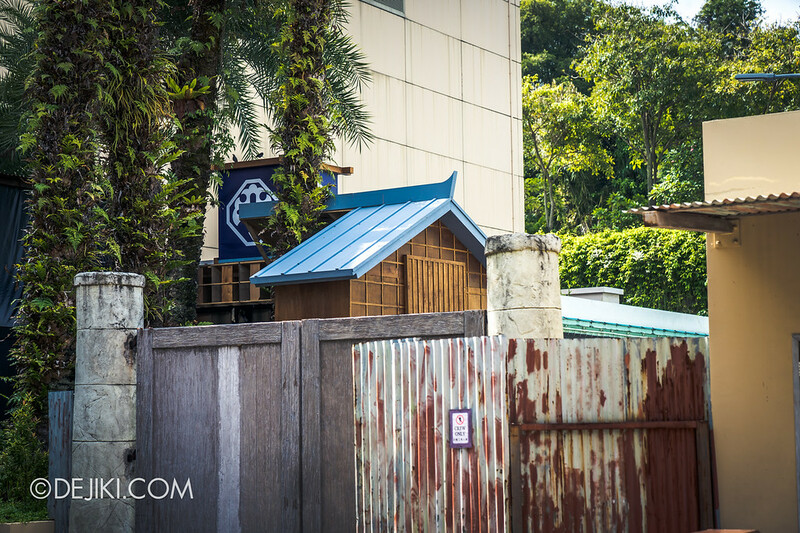 This week, I saw that USS has built one entrance to the Pagoda of Peril haunted house facing outwards (like some houses in the past: The MRT and Possessions). It looks like.. behind the two trees, there’s some sort of derelict building with a Chinese altar on the wall. The actual Pagoda is up! Where did I see this? It’s revealed in the vlog. 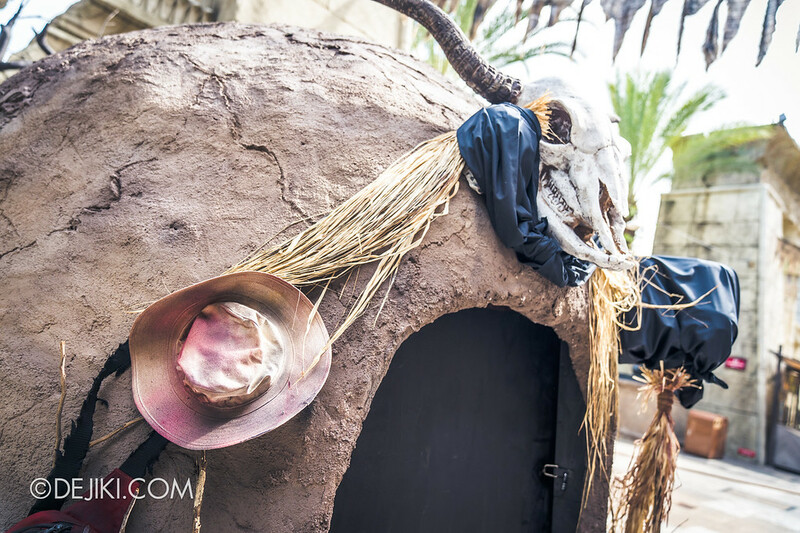 Said to be this year’s SCARIEST maze, the Pontianak haunted house has a humble entrance arch reflecting the Malay Village where the vengeful spirit will emerge. We’ll soon be able to run and join the line here to meet our new vampire overlords of the Killuminati clan. 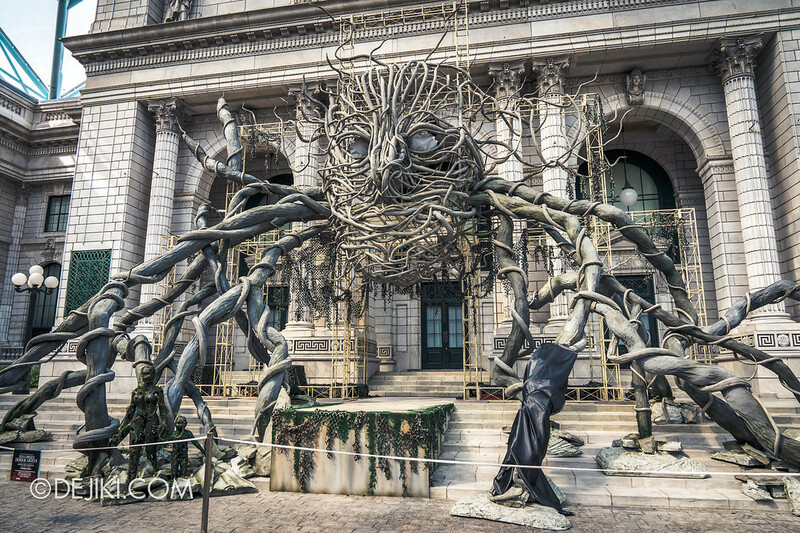 The queue entrance for Stranger Things haunted house has appeared at the Rockefeller Center in NY zone. Thanks SN for sending this in. 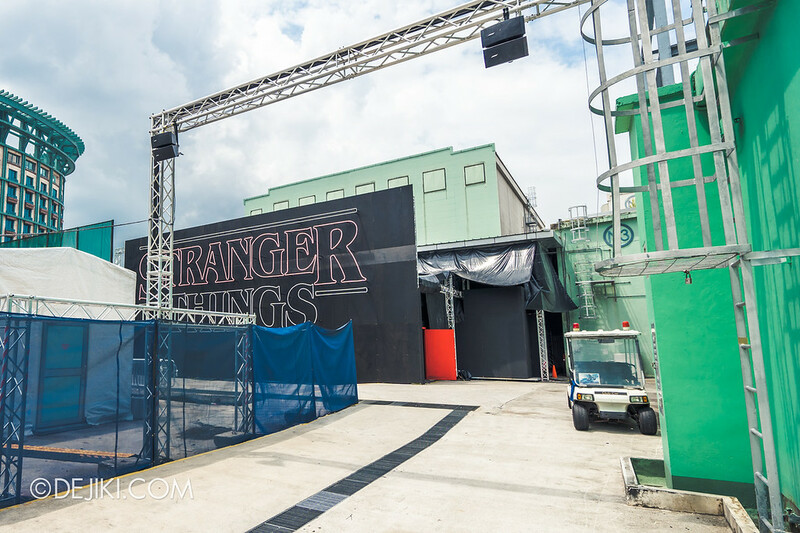 Last week I had a chance to preview the Stranger Things haunted house and saw the house’s surprisingly huge facade. Over here, the park is going to screen a 20-minute special cut of Stranger Things, so that you won’t be lost in the haunted house. 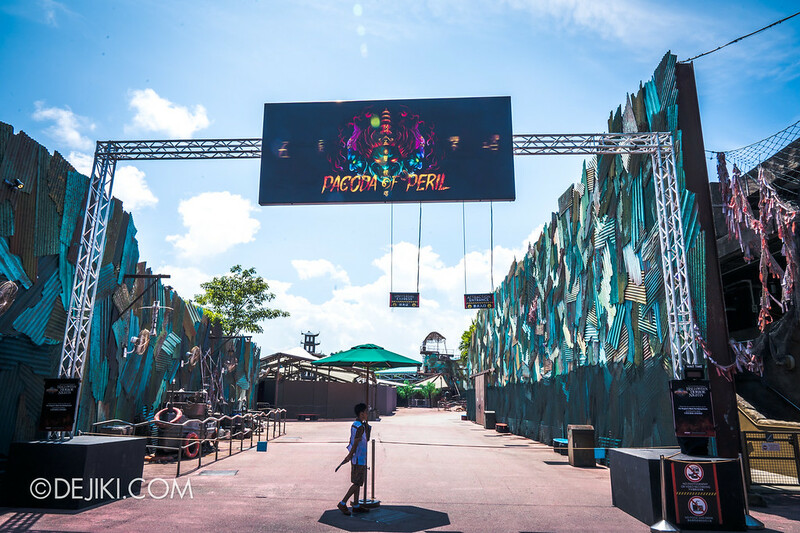 Over the past few nights, rehearsals were held secretly (or not so secretly), so what we’ve seen in the park so far are likely nearing the final state for HHN8. I won’t repeat all the photos again. If you have time, just revisit past Before Dark articles. 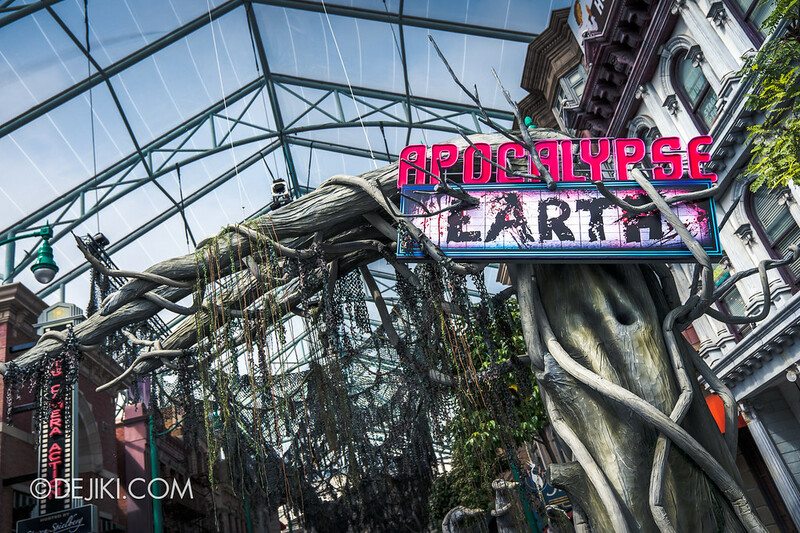 At Apocalypse: Earth, there’s more weathering, more reinforcements.. The giant face projection thing had its eyes added. 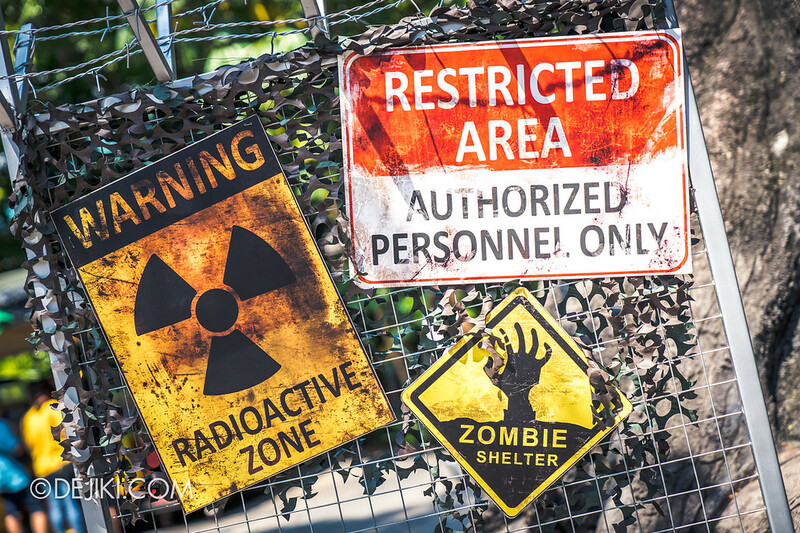 Nothing new at Zombie Laser Tag this week apart from these cool looking signs. Which means, there’s probably not going to be any crazy stunts like last year’s ZLT as the game area looks more focused on building an ‘authentic’ laser tag game experience. 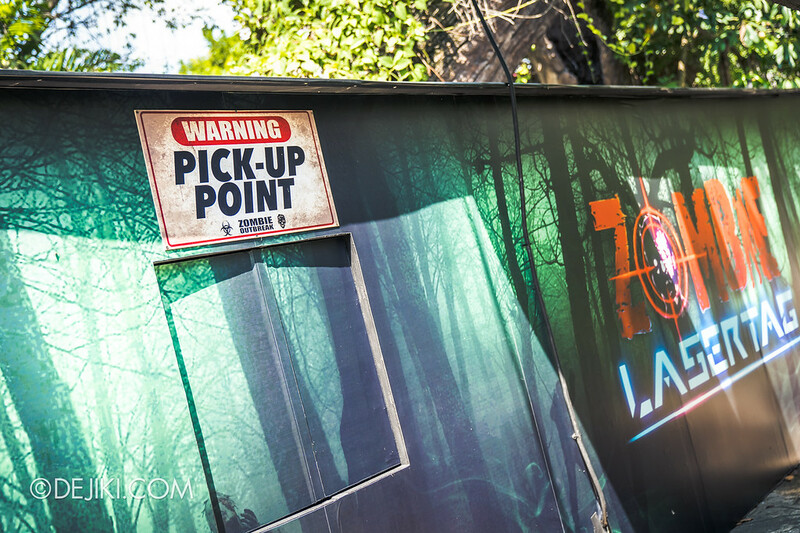 The Cannibal scare zone received some interesting additions. 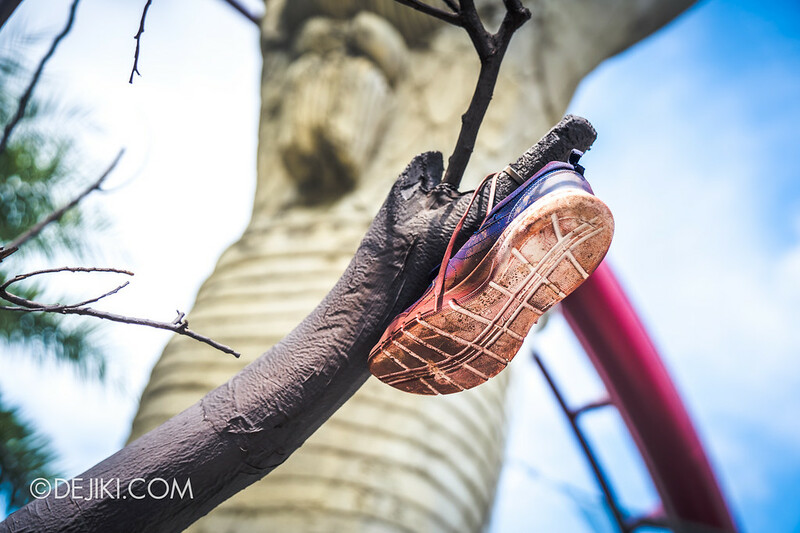 More shoes (on trees) and bags. Dear cannibals, these are not home decor items. Avert your eyes! 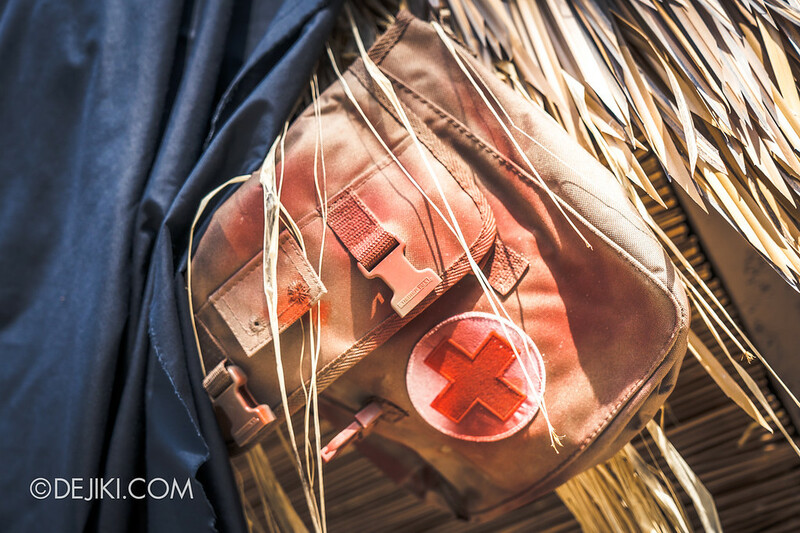 Covered props… EXPOSED! Lots of skeletons in this zone. Almost all the covered props in these zones are skeletons. Last week I mentioned about the new Little Monsters merchandise. The Minion Monsters line has returned for Halloween season. Thanks Jeremy for informing me! I’ll cover all the new merchandise in another update. 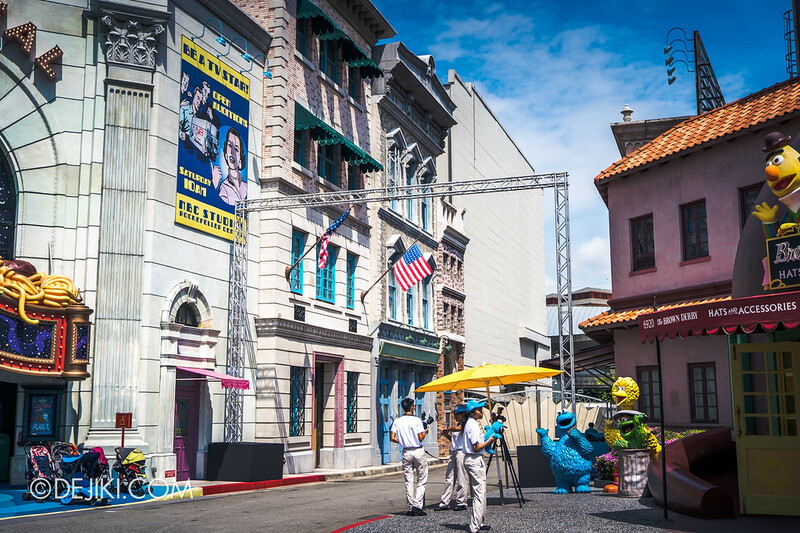 And now, here is a video of a full Universal Studios Singapore walkthrough. I’ll introduce all the scare zones and haunted houses to you. There’s also interesting trivia information about HHN and tips for anyone going to the parks for Horror Nights. The video was filmed rather spontaneously so I wasn’t prepared for the audio problems. And there are random pauses because the whole thing was unscripted and I was trying to recall past events from memory. Please watch with subtitles/CC as I have transcribed the entire vlog. I’m doing a giveaway to celebrate “this first vlog” – Just watch the video and count how many times my friends Tong Ming and Sin Ngee appears. As long as they remain in the frame during a continuous shot, it is counted as one appearance. 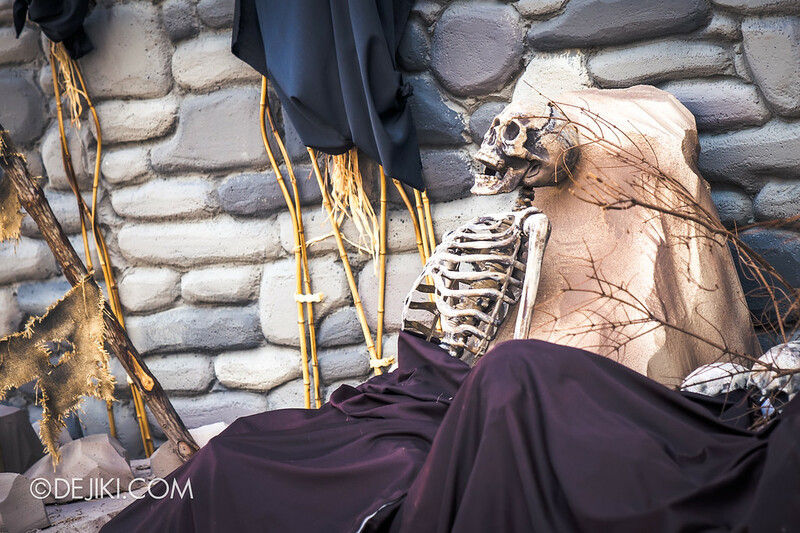 As for what I’m giving away, I don’t know yet – but it will be Halloween Horror Nights or Universal Studios Park related! To take part in the giveaway, post a comment with your answer. Comments participating in the giveaway will not be shown publicly on the blog. The winner will be announced in October! 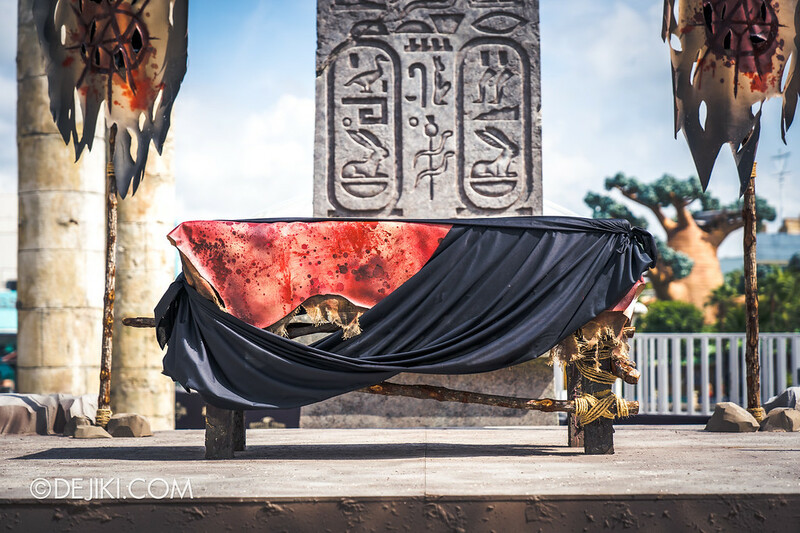 Are you ready for Infinite Fear at USS HHN8?